With an unorthodox set of effects and utility plugins, Stagecraft Software has forged their own path in the music software industry. This week, the firm has introduced the highly innovative Infinity Synth, which is available for free via Reverb for a limited time. We recently had the chance to catch up with founder Aaron Leese to chat about the new synth and Stagecraft Software's unique approach to plugin design. Can you give us a little bit of a background on yourself as a developer and Stagecraft Software as a company? I’ve been at this for about fifteen years or so now, but Stagecraft itself wasn’t really a viable company until maybe six years ago. I got out of college with an electrical engineering degree, spent a lot of time doing websites and kind of getting my skills up, and then got into music right out of college but couldn’t find a way to make money at it. It was only five or six years ago that Stagecraft started to take off. The first product we had that got any traction was a turntablism plugin, so kind of the first thing that you could use to read time–coded vinyl inside of it all. How many products does Stagecraft currently offer? We’re up to 15 or so. A number of effects, several synths, we just got a live looper, and have a couple more coming, of course, in the next few months. What sets Stagecraft Software plugins apart from others in the industry? Most of our products are a first in one way or another. You don’t redevelop the wheel, so we try to focus only on things that fill a unique niche or can do something that nothing else does or can do something in a different way. But secondly, I’m really a hater of skeuomorphic designs — the plugins that look like an old guitar pedal or something. I think the problem with those is that you can’t see what the knobs are doing straight out of the box. So a lot of times, you’ll have a knob that you’re tweaking and you’re going, “What is this doing, what is this doing?” It’s because something else isn’t on or something like that. We really try to make the design in such a way that every time you turn a knob or move a slider, you can see a filter change, for example, or you can see the spectrum response change — things like that. What determines a successful product for you? If I’m using a product eight months after I make it and am still happy with it, I’d call that successful. If other people are emailing me eight months afterward to say, “Hey, good job,” or “Hey, you know, here is a way it can be improved," I love that kind of stuff. I find it to be really, really fulfilling. I think that’s a lot of the success for me. What types of factors go into your decisions to create a new product? Speaking of new products, can you tell us about the Infinity Synth? What was the design concept here? Who worked on the development of this project? What can users expect from this virtual synth, and what features are you most excited about? 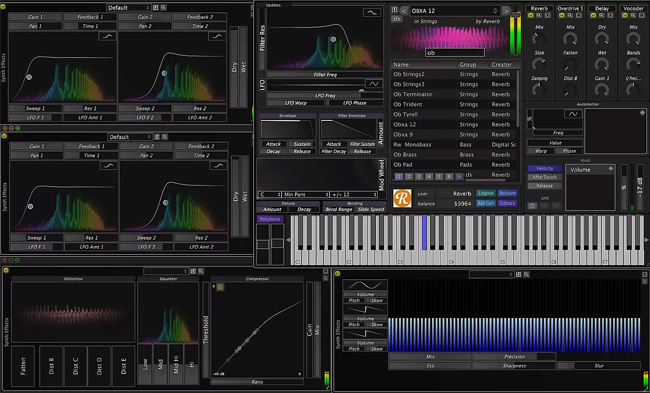 Infinity Synth is a sample–based synth. There’s quite a lot of those on the market, of course, so we’ve got a lot of competition. What sets it apart is that, generally, when you buy one of these, you get a sample pack that’s usually themed — like a set of really good, high–end piano samples or something. But with Infinity Synth, you’re getting access to a marketplace where you purchase whatever samples you want rather than having a bunch already built in. With the help of Reverb and a few other companies, we’re building out a large catalog of online sounds, each of which will be turned into a bunch of high–quality sample banks. The idea is that if you really only care about ‘80s vintage synth sounds, for example, you can customize your library to really fit your needs. On top of that, it’s a very professional synth. It has all of the stuff that you’d expect a sampler synth to have. In addition to just the envelopes and filter envelopes, you have effects chaining and the ability to drill down on all of the effects, so you can add very unique feature sets around these samples and build them out in a large variety of ways. This is one of the first synths to utilize Multidimensional Polyphonic Expression. What is it about this emergent technology that’s exciting? Is this one of the first synths to do this? There’s not a lot of software making use of it now — you can probably count on one or two hands, I think it’s probably less than 10 — so it’s still pretty early in the game. MPE, of course, made a lot of waves a couple years ago. ROLI, in particular, put out a lot of content, so you saw a lot of videos with guys playing on amorphous black surfaces or other kinds of stranger devices and getting really crazy expressive sounds out of them because they were sending out MIDI that was tracking not just the touch, but the pressure and the X and Y dimension of your fingers. You hit a key and then you can move up, down, left, right, or push harder, and it changes the sound dramatically. The first time I saw that, I was just blown away, and I had to get my hands on one. There was a review early on that said MPE made it feel like you were playing actual instruments, that you go to that level of expressiveness, and it very much feels that way to me. What types of MIDI controllers would you suggest to realize the full potential of this synth software? ROLI has made a number of really nice ones and they keep coming out with more and more. Plus, the price points are getting better. Roger Linn came out with maybe the first MPE instrument called the LinnStrument, and that is also a very impressive instrument. I’ve gotten emails from a number of Roger Linn’s users as well who use our software, so I know that it works. It’s also a really good community, you know, they help each other out, and the people are very engaged. Infinity Synth is free exclusively on Reverb for the next four months and comes with 1200 ready–to–use presets, plus a $25 credit. It features some of the Reverb Synth Collection presets for purchase, but can you tell us more about other purchasable presets and their designers? Right now, there’s only two sets because we just haven’t had that much time to keep importing stuff, which is why we’re at 1200. I want to get it up to two, three, and four thousand samples eventually. The nice thing is that we can build multiple presets on one sample bank, so this number is going to go up even if we don’t add a ton of content. There’s only two sample providers right now. Reverb, of course — you guys have a really nice collection of synths in particular and leads — and then there’s another company called Digital Sound Factory that we went through to get a lot more traditional sounds. They have guitars, flutes, and orchestral presets, plus some really nice pianos. Check out our demo video above, download Infinity Synth for free, download the free Ableton Session, and make your own remix. Share your remix using hashtag #InfinitySynthRemix for a chance to score more Infinity Synth preset credits and Reverb Bucks.